Hey guys, just a quick post about news from off the courts this week as Nadal has announced he's playing the Swiss Indoors in Basel and tournament organiser Roger Brennwald has once again started stirring up a media storm with what appears to be his own personal anti-Federer campaign. I mentioned my dislike for Brennwald a couple of times in my Federer IMG split post and when Roger announced his 2013 schedule. I've done a little more research today on him, watched a few videos of him being interviewed and there's just something “off” about him. Hard to work out but it's all in the eyes. After winning Barcelona (or Farcelona as Tommaso said on Twitter :P) Nadal has announced he's returning to the Swiss Indoors for the first time since 2004 where he lost in in the second round to Rainer Schüttler. I'm quite pleased he's turning up because it's always good to see Federer and him face off indoors. It's the purest surface in a sense as elements don't really play a big part and the courts are usually laid to play quickly which obviously favours the more talented player. One thing that's confusing though is why is Nadal playing an indoor hard court tournament when he's constantly telling the media there are too many hard court events? Yet again a confusing move. I didn't understand his motives but now I've seen Roger Brennwald back in the media slating Federer then it makes perfect sense and clearly the motive for Nadal is monetary gain and to allows Brennwald to get a new poster boy in town. You can bet your bottom dollar that Uncle Tony, aka the Mafia man who runs the ATP is behind it. Brennwald will be offering a huge appearance fee for Nadal in the tax haven that is Switzerland so it's a clear win for Nadal. I've always thought tennis was a means to an end for Nadal and even more so for Uncle Tony who treats Nadal and Tennis as his pet project so I guess this just proves it. If he was interested in just tennis, then he'd probably play Valencia instead which is run by Juan Carlos Ferrero and is the only indoor tournament in Spain. Obviously there are no loyalties in tennis and because Uncle Tony has $ signs tattooed onto the back of his eyelids then Basel was the choice. It also presents him plenty of opportunities for more sly digs at Roger in the media. Don't be surprised if Roger gets a ridiculously tough draw in this one having to meet all the good indoor players to even make the final whilst Nadal gets his clay buddies. Obviously Roger wasn't playing here, he never does and its clear to see why as I could organise a better tournament in my back garden. I thought Mickey Carlo was bad but Barcelona is just the ultimate bore fest. None of the top guys turn up other than Nadal and all he had to do to win the title was beat a Serve Bot who has no place in a clay semi final and then watch his friend Almagro bend over and hand it to him on a plate after blowing a 3-0 lead in the first set. Painful. I wrote a post last year about the Basel situation where Roger left it out of his schedule due to not being able to reach an agreement and negotiations grinding to a halt. Since then Roger has come out and said he will be playing Basel without a contract, this means no appearance fees will be paid to him, and he's playing simply because it's his home town tournament. Again, proving Brennwald wrong and proving his past claims have absolutely no substance. I had some skepticism about Brennwald's character last year as I didn't think Roger was the sort of guy to argue heavily over money or try and throw his weight around. Of course his agent Tony Godsick is going to try and get the best deal, he's a businessman, but I don't believe it would ever be to the point that it reflects badly on Federer himself. It was the very fact that Brennwald brought the negotiations into the public eye when there was no need that made me raise an eyebrow. Why would he try to alter public perception of Roger and portray him as greedy? Tournament negotiations should be done behind closed doors; surely a veteran business man like Brennwald knows this but his reaction is what I'd describe as immature. Anyway this week he pretty much proved he has something against Roger and has his own personal agenda to fulfill as he began comparing Federer to the rest of the top 4 and passing him off as arrogant. He basically said he can call any Nadal, Djokovic and Murray any time but he can't get hold of Roger instead he has to deal with Tony Godsick. He then went onto get his phone out and ring Federer's number in front of the journalists to prove a point. It's at that point you have to hand him the Sad Little Man trophy. We can not talk anymore. Federer no longer answer the phone. I have spoken personally with Nadal. Murray and Djokovic can call me any time. Probably the most ridiculous comments ever. Surprisingly he didn't ring Nadal or Djokovic in the Press Conference as I'd hazard a wild guess that they wouldn't answer either. If you were Roger, would you want to be taking calls from Tournament Organisers (that don't like you) trying to get you to play? The answer is clearly no. I found it rather lame to bring the media together just for that and then start comparing other players to Federer, Brennwald has clearly forgotten Murray has scheduled to play Basel for the past 2 years only to pull out at the last minute. Just very petty from a guy who is clearly in his sixties. As for why Brennwald feels the need to try drag Roger's name in the dirt then who knows whether it's jealousy or some kind of inferiority complex but he's made it personal. I've read a couple of things that aren't concrete but apparently the dislike stems quite far back. Apparently in 2009 the Swiss Indoors lost Davidoff as one of their sponsors and Brennwald asked Federer to take a 50% cut of his appearance fees so the tournament could get new sponsors. Roger of course agreed and signed up for the next 4 years. Then it's rumoured last year Brennwald decided to go on holiday during Basel and only came back to attend the final leaving Roger to deal with the sponsors himself and confirm he'd be playing Basel in the future to secure further investment. This apparently annoyed Roger as he was focused on playing tennis, not sorting out sponsorship deals which wasn't part of his remit, from that moment on he left Godsick to deal with Brennwald. Since then Brennwald has decided to paint Federer as the bad guy – perhaps Brennwald has a bad relationship with Godsick since IMG tried to buy the tournament off him a few years back. I guess the fact Roger wanted to buy Basel and have it as his own tournament won't sit well with Brennwald either. There's a couple of links on that here – Federer wants to buy the Swiss Indoors and If Basel is sold, I am very interested in it. If those are true then Brennwald is in a defensive position and wants to protect his investment so will resort to hanging out his dirty laundry. Or he simply hates the idea of Roger owning the tournament. It's all guesswork really as tennis is pretty corporate behind the scenes so it's hard to assess. I'm not sure we'll hear any more on this as camp Federer remains silent and I figure it will remain that way as Roger is a man of principle and won't stoop down to Brennwald's level. When I wanna talk, I'll talk! Thanks for a bit more clarification on this issue. It’s been confusing the past few days to hear bits and pieces that make Fed look greedy and difficult, which just doesn’t go along with what everyone who knows him says about him. This makes a lot more sense. Yeah Brennwald is clearly trying to slur his character. Can’t quite figure out why. Very good point. Roger has just been away practising yet Brennwald feels the need to bring this up 6 months ahead of the tournament. Maybe his days are numbered at Basel. Fortunately most fans see straight through him. Only the trolls are on his side. 1) “Roger wasn’t playing here, he never does and it’s clear to see why as I could organise a better tournament in my back garden.” haha, I didn’t watch any of the Barcelona tournament since I figured it would end up just as it did with a fellow Spaniard bowing down to Nadal (the unspoken code)! 2) “It’s at that point you have to hand him the Sad Little Man trophy.” Seriously! All he accomplished was looking completely ridiculous! Anyway, thanks for clarifying what you could on the issue…appreciate it! You did well to avoid Barcelona, I just tuned in for the final but switched off after Almagro decided to throw away the first set. Had break points to go 4 – 0 up. And then BP again at 4-4. Awful tennis. I think Natasja summed it up very nicely above – this says an awful lot about Brennwald and nothing about Roger. The guy is clearly bitter about something. Or maybe he thinks can sell more tickets with this kind of approach! Nadal always contradict himself about on many things like too many hc events, too long season and bla bla bla….Its a bit of a shocker to see him play at Basel – taking a dig at Roger eh? Its such a pity that Roger is being painted as villain here. Roger already made his stand clear – he intends to play even without a contract. Just a petty old man going through 2nd childhood phase – perhaps. Yeah every time – “the tour is too long” – plays everything. “too many hard courts” plays more hard court tournaments. Hello Jonathan & all, medium-term lurker here. I may have something to add. My German is essentially nil but my French is quite good. Here’s a translation of an article in Le Matin that likely originated with the same Brennwald press conference. Before announcing the grand return of Rafael Nadal to Basel for this ATP 500 tournament which will take place from next 21 to 27 October, Roger Brennwald first made sure to reassure his audience: Roger Federer will in fact be part of the group at the Saint-Jacques Hall. He also specified that the five-time tournament winner had not signed a contract. He will therefore receive no appearance fee, contrary to Rafael Nadal, but also to four other players with whom an agreement has been finalized: the title-holder Juan Martin Del Potro, the Canadian Milos Raonic, the Japanese Kei Nishikori and Stanislas Wawrinka. The deterioration of relations between the two men no doubt explains why Roger Brennwald has already (? – literally, “stopped his choice”) when the hour of succession sounds: he will not sell the tournament to Roger Federer or to anyone else, but will ask his collaborators to continue the venture. “Everything will be arranged so that an internal solution can see the light of day”, he specified. The fact that Roger Federer will play “for free” permitted in part the securing of Rafael Nadal. “Nadal is not the player who was given the biggest fee in the history of the tournament, clarified Roger Brennwald. He came for several reasons: the wish to play a high-level tournament in order to gain points which will help him achieve the best possible ranking at the end of the year, and also the desire to honor a promise. In 2006, Rafa had to pull out at the last minute, when he had just brought home, in Madrid, his only indoor title to date. He swore to me he would come back to Basel.” We know it, the player from Manacor is a man of his word. Rafael Nadal has already played twice at the Swiss Indoors, in 2003 and 2004. He was beaten both times in the first round, by Rainer Schuttler and Feliciano Lopez. The prospect of a duel between Roger Federer and Rafael Nadal will of course contribute to the popular success of the biggest sporting event in the country. As of today, two thirds of tickets have already been sold. It is presumed evident that play will take place with ticket counters closed on Friday, Saturday and Sunday. ***Christiane Capt, 30 April, 21:29: How can you write this article and not come to the defense of Federer?? You have a short memory & go read in your archives!! You’ll find that in 2008 Basel lost its principal sponsor Davidoff. To ensure the survival of the festival, Brennwald appealed to Federer who agreed to reduce his participation fee by 50% and thereby he gives guarantees to the sponsors for a four-year contract! In 2012 the contract is up!! And surprise!! This dear Director is absent from the tournament!! For reason of vacation… Federer plays his matches and replaces him in receiving sponsors, exhibitors etc…. and assures them his participation will be renewed…. Brennwald only comes back for the final! 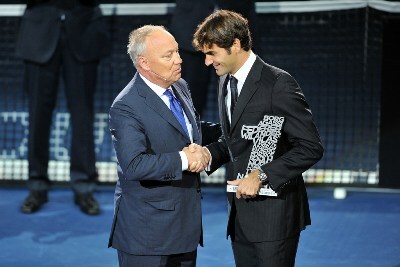 And the prize-giving… Roger demands an explanation! The tone (ed: of the discussion) mounts… and he plays the final and I imagine furious and justly so!! And it’s just after the tournament that this dear Director noises it about that Federer is an ingrate! That he wants an increase and the tournament can’t permit itself to do that!! Following all the preceding, Roger asks his manager to resolve the problem. Roger recently announced he would participate in the tournament and informed that he doesn’t need a contract and doesn’t need one to play at home…that certainly didn’t please Brennwald!! He’s not paid, is coming for his public and his fans and this dear Director can bring out an astronomical sum to bring Nadal!! He’s not credible and I hope this rancor will turn around on himself!! In any case Brennwald is no longer master of his tournament, it’s FEDERER who has decided he will play Basel because he wants to, for himself and for his public? Thank you for putting the church back in the middle of the village and not letting Roger get passed off as the most ungrateful guy, he who is just the opposite and the most fair and beloved sportsman on the planet! Charles Gavillet, 29 Apr, 17:18: At the unique level of R. Federer, it’s comprehensible that he would put his agent in charge of managing as many things as possible. As for the (garbage-unloading?) of the President of the Swiss Indoors, hello ambiance. Who’s the boss? Question: who needs the other most? – (At last year’s Basel final), (former Swiss player & tennis commentator) Marc Rosset said on-air that he was disgusted with Brennwald’s attitude, leaving & going on vacation at the moment of re-negotiating contracts, and that Roger is furious and justly so. – When you see the list of staff for Basel (it’s in the programme) it’s longer than the list for Wimbledon. Hi Thinker, love your comment and the other comments you posted. Do you have more of these comments that other people have posted? I would love to read some or love to know where the translation of the posts are. Pascal Legendre, 29 Apr 21:42: At the same time, tournament directors, they come, they go, and nobody cares. While with a Federer, you’ll have to wait 150 years before finding another. On the other hand, I’ve always had a little bit of a hard time accepting that he didn’t want to give Switzerland a chance to win the Davis Cup. Because for two years already, he’s convinced it will never happen. Dominique Golliard, 29 Apr 21:37: (In reply to Serge Kolly, who had said Federer “tires” him): Federer tires you? Are you one of those people who thinks sportsmen should disappear after 5 or 6 years, leaving their place to the younger ones? When you have the CHANCE to see a sportsman such as Federer, in ANY sport, you watch, you admire, and you keep your mouth shut. The fact he’s Swiss is a bonus for us but not the most important thing. If you like and understand tennis ….. you can’t have had enough of (or “be bored with”) watching him play. ALL of the greatest champions are struck with admiration at Roger’s tennis, and can no longer find words to describe it. As for Basel and Brennwald, you’d have to have both versions of the facts in order to forme a fair idea. Criticisms come chiefly from those who are jealous or frustrated. Christian Tello, 29 Apr, 18:54 (in reply to Arnold Stauffer, quoted above): Completely agree! Not to mention the fact that if RF had deserted this tournament in these last years, the public would undoubtedly have done the same. Such hypocrisy always makes me laugh. If they’re prepared to pay the price, it’s because they’re sure of having a return on their investment. Like when Nike pays Ronaldo or Messi to do some publicity – it’s not just for the pleasure of coughing up the money! For myself, I guess I see Brennwald talking out both sides of his face. On the one hand he talks about “always rolling out the red carpet” for Roger, who “deserves it a thousand times”; in the next breath Roger is the most difficult sports figure to deal with, ever. He would love to be able to talk German with Roger, but apparently doesn’t feel the need to exert the common courtesy of not speaking a language one of those present (ie Godsick) doesn’t understand. It definitely feels like there are pieces of the story missing. It also feels to me like he’s turning this back on Roger to deflect attention from himself – which makes me wonder what he might be hiding. Certainly the whole thing leaves a bad taste in the mouth & a sour stomach too. Kudos to Roger for keeping his eye on the past history with Basel, ballboy youth, loves giving the current ballkids the pizza party part of his relationship with Basel, and not letting Brennwald – bully him, really, into leaving the whole thing behind. Also meant to say, it almost looks like Roger is making sure to have witnesses to his dealings with Brennwald – which Brennwald is also turning back on him, saying he never got back to them. Wonder who really dropped that ball? Brennwald sounds really offended, and his response is to try & offend Federer back. He Thinker, thank you again. I love to read such comments. About Rafa playing Basel: I have a feeling that if Roger were from now on to lose a lot (hope does not happen !!! ), Rafa will play Basel. But if he sees Roger winning some important titles before Basel, I think he will find a way to get out of playing Basel. Somehow I think Rafa has got it in his head that Roger is not doing well this year, might last until Basel, so that would be a good time for him to play Roger. I can see the Great Uncle Toni and Rafa thinking this !!! Thanks very much for posting this and translating it all. Very interesting. Give Brennwald enough rope and he’ll hang himself. Maybe he should go into politics. Seems like the type. It must be very hard for Roger to ignore the crap and go play tennis. As far as Nadal. Really, can we believe anything he says. The appearance money must be quite handsome. And yes, the draw will be interesting. Yeah good idea Sue, probably be a “good” politician based on the amount of rubbish he can talk. 7 figures I bet for his appearance. Tax free. Nice. Indoor clay event haha. Not unlikely! Yeah maybe the publicity is what he’s after. Weird way of going about it but controversy can work that’s for sure. Not a bad call on Nadal pulling out, depends how he holds up over the hard court tournaments. Uncle Loony haha not heard that one before! Are you kidding me with this? Is this for real?!?!? Yeah I’m not happy with that either! Football training top that. Poor! 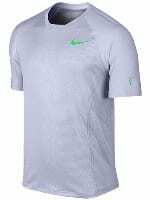 This top is for Roland Garros. I don’t understand why this isn’t going to be what Nadull wears. Can’t wait for Fed’s mint and gold polo for the season-end indoor tournaments. I don’t understand why Roger wears grey at RG. He does not do well at RG wearing grey !!! Why does he not wear that red, he wore when he ended Novak’s streak !!! He should wear winning colours !!! (No, I did not mention orange !!! Really, I didn’t !!!). Yep, Katyani! Red looks good on Federer. The 2011 French and 2010 World Tour Finals. Classic. I think Rafa’s doing it for the money tbh. He says that he needs to cut his hard court play yet adds INDOOR tourneys! Weird that Nadal’s comeback includes losing MC yet winning a hard court tournament. Do you like Nadal’s chances for year-end number 1 or at least 2. He has nothing to defend at all Wimy and onwards. I think that’s unlikely to be honest. Djoker is the man to beat this year. I have a feeling that he will get a couple of big wins over Nadal. A great beginning (winning a lot) and then not so good at the end of the year. Rafa may be Superman Trilogy/Saga, but even he is or will be 27. He made 6 finals up to now, I cannot imagine him making every final till the end of the year. No, Novak is going to be number one for a long time, until Roger decides enough is enough. Or maybe…. Andy. But if Rafa needs 7000 points or something….. even Roger could not do that in a year I think. Hi Jonathan, very !!! nice article. Thank you for that. Just shows you. Two guys with the same first name and look the difference between them, one a true sportslegend and beloved by millions and millions and a true and genuine gentleman and the other…… I will not even take my precious time to write something about that loser. This also says exactly what I always said. The tennisworld does not deserve someone like Roger. While all the others (Rafa, Novak, especially Andy and all the others) only concentrate on their games and practise, Roger has got to do that too, along with familytime and meetings and pressconf on behalf of the ATP council. While (if I am not wrong) Rafa and Andy flee from that, Roger is still the President and still (I think along with Novak) has meetings and press and takes so much care for the council so that other players will benefit. Players who are ranked lower and players who will play after Roger retires. He is doing all of this to leave the sport he loves and owes everything to, behind in a good way for the future players. Really, the tennisworld does not deserve someone like Roger (not that he is perfect himself, but he is not a golddigger or hungry for money AT ALL). Why does he not quit as the President and like all the others concentrates on winning everything too? You know what the sad part about this all is? We know now the real reasons, Jonathan, because you explained it to us, and the Swiss people know it, but the rest of the world and tennisworld do not know this. So, again, Roger will come out of this (undeserved) as the bad guy. So hope, Karma decides to pay him in titles because he has to endure this all. I think most tennis fans are on Roger’s side here. Not that anyone needs to take sides, pretty obvious Brennwald doesn’t have a big voice – he had to organise a media conference to pull this stunt. No doubt the next time he wants to slate someone it will fall on deaf ears. Did anyone see CNN last night about that Spanish doctor Fuentes or something??? No comments yet from anyone of you? Not even about Rafa? In three months, reaching six finals (never anything less), winning four of them???? Really, no mention from anyone of you??? Not even you Sid??? I can think of only one way to resolve this debate. Have these two run for the Mayor. Let the people of Basel decide who they love more. I bet you the Nadal’s will endorse that crazy Director and pour in millions in campaign donations. Hi Sid …for a minute there i thought u were wanting Fed and Brenwald in UFC match up. But isnt running for mayor and fighting in a ring the same these days???!!! Or maybe Brenwald can fight his own boardroom people one by one. If Brenwald doesnt like Fed who seems a really genuine person, clearly there must be something wrong with Brenwald. Or is Fed the greedy person as he puts it??? I really doubt it bcos all Feds actions and what he has done ie charities, fund raising etc etc says the opposite. I have not found one person, even among Roger’s biggest haters, making a statement that Roger is greedy. That argument is simply out of question. Actually, you’re right Jonathan, I don’t. But I’d be very surprised if someone thinks that Roger is in it just because he is greedy. Would be the biggest election turn out in the last 100 years I reckon. You’d get fans crossing the Swiss border trying to vote. Hahaha! The numbers will say 145% turnout reported. Hey Jonathan… I found this post very intresting to sy the least. Brenwald clearly doesnt like Roger and he is using all schoolboy imature tactics to try to get back at Fed. Brenwald comes across like a grumpy old man with too much money that its got to his head!!! Brenwald clearly wants a reaction and Fed to speak out about this situation. But true class comes from Fed as hes not speaking out and playing these childish playground games. Yeah the only person that comes off bad in this is Brennwald. Pretty immature really. Anyway, Madrid creeps closer, back on topic and on court for the next few posts! Nice write-up, summarizes the situation well! Brennwald comes across as a really low-rent old guy here. I mean, what the hell is he trying to prove? He is failing miserably in portraying RF as the bad guy. As much because of Federer camp’s dignified silence as his own ridiculous actions like that phone call in front of journos. It just saddens me that Rog is loved so much across the world, will probably have scores of TDs ready to gladly pay him handsomely to play at their tournament, and yet the one place where he deserves the most love and respect treats him like this. Had Basel not meant so much to him, I would have wanted him to say a big FU to the TD, a gentle sorry to the fans and skip the tournament. Play Paris, more points! And about getting Nadal…I don’t even want to start. But the parents of all ball-kids can start a protest of sorts. For if he wins, he’ll pour wine in their underage kids’ mouths. Roger goes for friendly Pizza party instead. Yup, I don’t what his background is in terms of businesses he has run but seems very petty for a guy that’s clearly been around this kind of world for a while. 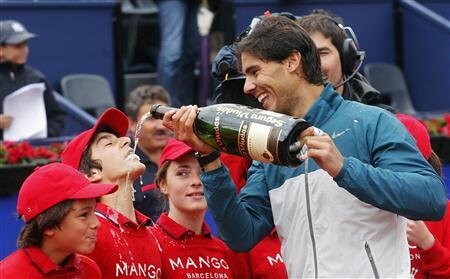 Haha I saw the Nadal thing, is it actually alcohol they get in the bottles or just plain fizz?! Fedfan, please tell that that is water in that bottle or apple juice !!! Wish I could. The link I saw it on says its ‘cava’, which is Spanish wine! Guess its okay in Spain for kids to start drinking early as nobody seems to have a problem with that picture. In my country, it would have created a media storm! Not only in your country, in my country too !!! FedFan, what a difference between your comments about Roger and the comments from Fed star !!! I read the comments of this ‘Fed Star’…and all I’ve got to say is please don’t compare me with a troll! Oh no, no, no! Is that really alcohol being served to kids? What else will this man do for money? My respect for him, if I had any at all, is now close to zero. I’m so disappointed in Roger. The TD is obviously an idiot. But I’ve noticed for a while now the change in Roger. The young man who burst onto the scene shy, humble and respectful. Has gradually turned into cocky, greedy and figjam. While I still like to watch Rog play. He’s turned into corporation Roger dodging and weaving, but getting found out. In press conferences after he’s lost or when he wants more money to play a tournament. Unfortunately money is the root of all evil, and it appears to be affecting Rogers thinking to much. I have hope he will snap out of this and get back to being the person I admired, but I fear the worst. All opinions are welcome but unfortunately you don’t have a clue what you’re talking about. Anyone who has followed his career will know he’s pretty much the same as he’s always been. I don’t recall a time ever when Roger has chased money. If anything he’s forfeited it by scheduling carefully and not representing every single brand under the sun in terms of sponsorship deals. You know, Fed Star, you sound like well rounded troll, and I probably shouldn’t feed you. But, in support of what you said, “dodging and weaving, but getting found out”, can you please cite two concrete examples rather than resorting to mere rhetoric? And please don’t tell me how Roger wants to own the Basel tournament because clearly, he has agreed to playing there without any appearance fee. We’ll agree to disagree. But what I’ve heard from my friend who works at SW19, Rog is very different from what you think. Or at least in her dealings with him. They were much easier and nicer players to deal with, that’s all I’ll say. That’s probably because overtime he’s let fame go to his head, and its affected his attitude towards people. But I have hope he can change his behavior and become the nice respectful man he should be. mm, very strange! I too have a friend who worked at Wimbledon last year and her comments about Roger are the exact opposite of your friend’s. She said he was extremely charming, friendly, helpful and respectful with everyone at all times. He was also modest and one of the most genuine and likeable elite sportsmen she’d ever met (and she’s met a few from various sports over the years). I have faith in Rog though. I’m sure he can get his life back on track. How much is Uncle Tony paying you to infiltrate my blog Agent Fed Star? Jonathan, it is not Uncle Toni, it is the Great Uncle Toni. Don’t forget the “Great” part !!! Not even allowed to leave a comment nowadays. Which doesn’t suit your liking. I feel sorry for you. All I do is come here to read your blog. Give my opinion, leave a comment. And I get called an agent. Very disrespectful, I hope you don’t always act like this. You start a blog, your going to receive comments. If you want them to fit your view. Change your blog to North Korea Perfect Tennis. Don’t question me or belittle my friend. You don’t know what she’s had to overcome in her life, don’t question her or my integrity. You don’t know me. I come here to express my opinion and contribute to your blog. And you shoot me down. if you had any morals you would apologise to me. You know what, I couldn’t help but reply to this one. You come to a Roger Federer blog and you say something like, “he needs to get his life back on track”. That, my friend, is disrespectful and you should not be talking about morals. There is something called courtesy when you go to the fan blog of another player. This is not YouTube where the majority of the junk of the world lives and comments. Life back on track? He is the greatest tennis player ever (so far). He is a husband, a father to two beautiful children, he does so much for charity, and as the head of the player council, he looks out for other players and has won the sportsmanship award (voted by his peers) how many times? Countries all over the world think of him as their adopted son. Rod Laver almost considers him to be like his own son. At his age, he is giving all these power players a great fight and is still in contention for slams. Roger’s life is well on track. There is no need for anyone to apologize to you. You owe us an apology. You were allowed to leave a comment, I could have chosen to just deleted it but it stands. Needless to say, I won’t be apologising. Next. Hi Jonathan – haven’t posted in a while but this behaviour of Brennwald I find rather bizarre! He reminds me of a pantomime villain – all bluster and bombast at the beginning but pathetic and desperate in the end! It’s puzzling that RB should continue to publicly diss Roger calling him greedy etc, when Roger is playing without an appearance fee. There must be something else rather than purely the money angle that bothers RB – we’ll probably never get to know the real reason, but RB’s behaviour smacks of desperation to me. Good likeness, maybe he does have a future on stage as the bad guy! Yeah I doubt much more will be said. No doubt he will be very pro Nadal as the tournament grows closer and starts hyping it up as the best Basel ever, finally got the best players in etc etc. Brennwald has always been someone I don’t like. Why would he bring the negotiations into the media when he knows Federer said playing without a contract isn’t an issue. Yeah strange one. You’d think someone who has probably done hundreds of deals in his lifetime he’d know better. Clearly there’s some animosity here between the parties. In the worst case even if Federer doesn’t commit to playing Basel I just want to point out that: Federer does get appearance fees in the one mil range from Rotterdam and probably Dubai so that’s his market price. The only reason he takes less for Basel is sentimental reasons but that shouldn’t be an obligation. If someone wants to give a hometown discount then that’s fine (consider that a favor) but if he doesn’t and asks for what other places are too willing to pay him that’s his prerogative. Favors are given by not demanded from. Yeah I think Rotterdam and Dubai are both 7 figures. But that’s just the going rate for any of the top guys. How do you think Fed is going to start/Hold up on clay now, in Madrid? Now, i know this is impossible to answer logically as we haven’t seen fed play since his back injury mishap since IW, but i just want all of your opinions based on everything you might know about fed and how he did in his practice sessions + your gut feelings! Be honest! Difficult to say. I think he will be in pretty good shape. Semi Finals. If he plays Nadal I figure he could lose (if it’s a Quarter). If he makes a final against Nadal then I rate his chances higher. Hi Alvi….wow a very good question??!! It depends on what sort of Fed turns up? I think his back problem will b ok, but like u i am also confused on how he will play on clay. I think he will b a little rusty but will play at a mediocre level. Sayin that it really depends who he is playing, the first round he could play immaculate and then play well below his level in the later stages. TBH i hope Fed comes back strong and wins a tourny and gets his winning streak back. Fed just needs to take it one match at a time. But we know the tourny organisers will no doubt give Fed a tough draw!!! But Fed loves a challenge Come on Roger!!! Hi Alvi, wow, you mentioned little old me…… I am happy with that !! No, to be honest, it has been two too long months. I just want to see him play. And I agree with Ru-an on his article. I think, just like him, I will be proud of Roger if he makes it to the semis of Madrid, Rome and RG (anything less will be a slightly disappointment). But of course making the finals of Madrid, Rome and RG will be even better. Winning them or one of them will be….. buying everyone around me a cake !!! For me also, I think it is a little bit difficult. The Roger from last year wanted his three goals so bad (Wimby, world number 1 and Olympic medal) he did everything to gain that and I mean everything. Of course last year’s Roger is not this year’s Roger. He has not got those goals (has a bit more back problems) and to be honest, I think he will do a lot to get RG, but not everything for that. He will think let Rafa and Novak battle that one out for theirselves and let me concentrate on Wimby and US Open. Somehow I think he will give his all and I mean his all to get Wimby for the 8th time, because I think in his backmind he knows Rafa will win his 8th RG and he does not want Rafa to have the satisfaction of getting an 8th GS alone. Also I think he loves this time away where he was beeing underestimated. Beeing somehow written off and beeing not even mentioned as one of the favourites on clay. I mean, he has won Madrid last year and there are articles saying that Rafa is the favourite for Madrid !!! What is up with that? he really is not even mentioned as a favourite or one of the favourites. (The Great Uncle Toni put him even after, yes after, Ferrer !!!). For me, I just want to see Roger and to see him play. These two months were so long, what will become of me (or us) when he decides to (R-word)???? A long comment, hope you got your answer. Wow, believe it or not, I have the exact theory behind Roger wanting to win the 8th Wimby. One additional aspect is that by winning the 8th, he would officially establish himself as the greatest Grass-courter in the Open-era (above Pistol-Pete, and that is nothing ordinary)! 1. Roger isn’t exactly looking for a win at Madrid but a strong finish, you know, to get them old clay legs back. He may be more interested at Rome this year because, let’s face it, that is the only thing other than Mickey-C missing in Roger’s papers! And now that “Djokomickey won the Carlo” 😉 i think Roger would work even harder to get Rome. 2. Roger is going to come to the party at Madrid with all guns blazing, and i’m talking about Armageddon son-of-a-gun mode! Rome isn’t exactly his favourite and Madrid is like Hamburg for Roger (where he is loved extremely) before it was demoted. So yeah, he could be looking forward to repeat last year’s result at madrid. Yeah, gut feeling says he will be pretty rusty but i think he can cope up like he did at the Aussie Open. But if he DOES want to win Madrid, he must go all Super Saiyan ! Alvi, so Rome will be to Roger what Cincy will be to Novak: take that win no matter what !!! Hope Roger can get Rome (will have to get through Novak again I think) and to be honest I hope he ruins the plans for Novak by winning Cincy. Is that not the tour Roger is extremely good at? If he can keep Novak away from winning it, Novak will have to wait a year longer to get all the 9 ATP titles. Sounds not fair from me, but as much as Novak deserves to get all nine, Roger deserves to get it first. Who knows, if he wins Rome this year, he will even play MC next year. I cannot wait for him to play. Unfortunately I think all the pressure will also be on him, because he took two months off to practise on clay. Madrid is so doable for him, but with Novak and Rafa…………………. I think Rome is pretty unlikely. I think he will make Semi’s in Madrid. I saw the draw. Roger’s quarter looks okay for a change so I expect him to get through to the semis, though he’ll come in rusty. I wouldn’t mind if he doesn’t start great and scraps through the first couple of matches, just to peak at the right time. And then of course, the semi- who’d have seen that coming? Such a random draw, I tell you! Unless Roger is playing god mode or something, I fear 20-10. But one thing I’ve learned as a Fed fan over the years is that you never count the guy out! As for my gut feeling, somehow it never works in Roger’s case (works 9 times on 10 for my fav cricket teams)! Bwahahahahaha! Djokovic-Nadal, Inglorious Grunters, the next episode, it will be then. Surprise draw for Nadal in my opinion. He has to get through the dangerous Almagro and Ferrer, then deal with Roger. Roger’s second round is tricky. I don’t like it. He has to likely face Bernard Tomic after such a long break. I’m telling you, I’m really am scared. Meh, he’ll have played a match before, and Tomic is a joke on clay. I think you’re overracting 😀 😛 he’s gonna make semis, and if he’s in god mode or jesusfed or something like that he could pull it off. We’ll see 😀 glad to see him back on court soon. Simon, Roger has a first round bye and his match against Tomic will be his first. Tomic may be a joke on clay, but with a just out of vacation Roger, sort of, you never know! I can’t see Tomic doing any damage on clay. He can’t play well outside Australia. I think Stepanek will probably beat him. Hey Alvi, I’ve been mulling this one over for a while and see from reading other’s comments I’m pretty much in agreement, except on one point. I have greater concerns about the “back injury/issue” It just seems like he struggled with that for a long time – so I’m hoping it’s healed and doesn’t creep back up to cause trouble especially sliding around on clay. BUT, if his back’s ok, I think he’ll make the semis. I absolutely despise people of the ilk of Brennwald and the commenter who calls himself FedStar. It is precisely people like these without decency, integrity or values who contribute to the nastiness of the world we live in. Regarding the author’s comment “..Roger has come out and said he will be playing Basel without a contract, this means no appearance fees will be paid to him.” this is a false assumption based on the lack of info we know. Federer could easily have no contract with the tournament and still be paid an appearance fee. A contract is to ensure someone plays or agrees to for a number of years for example. Federer’s situation may be that he doesn’t want to commit so far ahead and so has no contract. It doesn’t mean he wont play nor ask for an appearance fee. There’s a whole lot of blind assumptions and flawed conclusions going on about this scenario but the one thing you can be sure is it is undignified, not to mention unprofessional, to conduct stuff like this in public. Interesting perspective, Bobby. I just want to point out that it’s not just Jonathan saying “no appearance fee”, the mainstream media is reporting it too (such as in the Le Matin article I translated above). I did double-check though, and that part is not a direct quote from Brennwald. On the other hand there’s no hint of there being an out-of-contract appearance fee, and several hints that there isn’t. The no appearance fee thing has been reported all over so I’m assuming its pretty accurate. I’ve not heard of a player getting a last minute appearance fee. Mr. Jonathan, i think its best if you get the side of BRENNWALD. Thats what you call balance blogging. additional facts. Maybe Fedstar is right on some of his comments. Vammooss! Brennwald’s side of the story isn’t something required. The fact he went to the media and tried to ring Fed in front of them to say “he never answers my calls” completely invalidates any need for a balanced argument. It’s still pretty troll free here really. Batman’s not a troll I don’t think. It’s good to have different opinions and non die hard Fed fans making comments too. My definition of trolls are people who comment just to piss of others with statements that mean next to nothing, and yours correspond pin point to that description… Or that put a ridiculous amount of punctuation marks, caps, and smileys. Like Sid said, this is a blog about Roger, ‘course it’s gonna be biased… what did you expect? All the comments saying Federer is an idiot, all hail Nadal, king of drugs… sorry, I meant tennis? Haha relax everyone. Batman isn’t so bad, he knows Fed is the GOAT but chooses to be a Nadal fan. I don’t mind that. Roger was very rusty in the first couple of rounds last year. And he went on to win the title. No one cares about Monte Carlo, lowest profile Master 1000, should be scrapped. Halle should be the replacement. I fancy his chances against Nadal more in a semi final than if they’d met in a Quarter Final, 1 more match could give him some decent confidence and into the groove. Will still be tricky, depends on the court speed. And of course he has to make it that far first. Could just be another Djokovic win in Madrid. Impossible to predict what can happen with Fed. Nobody has seen him play in 8 weeks. Take that Brenwald. In your face.